Confession time.Â I’d never finished reading a Stephen King book until five years ago.Â When I was 24 and becoming serious about writing, I knew I had to start, so I grabbed a copy of IT and went to town.Â I’d read plenty of King’s short fiction, but never made it through a novel.Â That has since changed, and I’ve devoured a majority of the man’s work. Until last year, though, I’d never given the Dark Tower books a try. While trying to remain spoiler free, I’ll say The Drawing of the Three was much more enjoyable that The Gunslinger.Â Sure, The Gunslinger started it all, but it fell flat for me, while I wasn’t able to put The Drawing down. This book tells the story of Roland, the gunslinger, wandering the desert as he gathers companions for his quest that will lead him to The Dark Tower.Â These companions: junkie Eddie Dean and crippled Odetta Holmes, come from another world (which just might be ours). I don’t dare say any more for fear of spoiling you. The story crackles through this book, and we finally get to know Roland a little bit.Â Through the previous book (which is probably my least favorite King novel) the gunslinger seems to lack any real sense of life. He’s all over The Drawing, though, and he’s incredible.Â As grand as he is, however, he pales in comparison to Eddie and Odetta, who are some of the best characters King has ever written.Â I’ll continue reading the books to see more of their adventures, if nothing else. There are some cons. 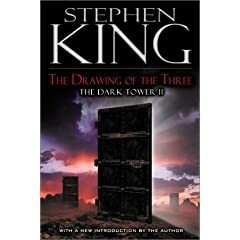 You do need to read The Gunslinger in order to understand much of the book, and we still don’t really understand why Roland is seeking the tower. It’s probably still worth your time, though.